CAKE Amsterdam: Ain't NO PARTY like a TOMTOM party! Ain't NO PARTY like a TOMTOM party! 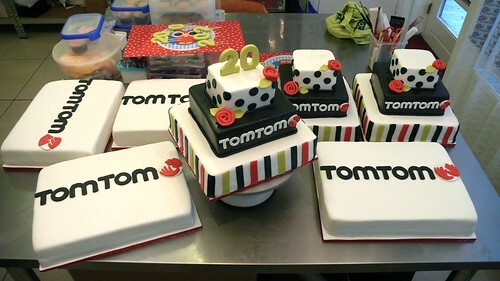 TOMTOM birthday cakes, a photo by CAKE Amsterdam - Cakes by ZOBOT on Flickr. For TOMTOM's 20th Anniversary the entire staff of all 3 head offices here in Amsterdam (over 1400 people!) received cake and cupcakes with TomTom logos!!! Special thanks to my team! Patricia, Mark & Peter from SWEET THINGS, Katie Holder (master logo slicer! ), Julie Wintrip of QUEEN OF TARTS and Tim Painter (delivery boy extraordinaire).